Bearded Dragons make some of the best reptile pets. They reach a manageable size of about 18-22 inches and only require a 40-75 gallon enclosure. Getting a Bearded Dragon is a serious commitment. They can live from 5-12 years in captivity. We had Eddie for 10 years before we had to have him euthanized in 2005. He was the oldest Dragon my vet had ever seen at the time. Eddie and Bisquik's page has relocated here. Bearded Dragons do require a few very important things to remain healthy. Proper cage flooring: Do not use sand for babies or juveniles. If swallowed, sand can be harmful or even fatal. Newspaper, paper towel, cage carpet,cork flooring or linoleum is best. Cork tiles are recommended by some because they are relatively soft and have high thermal insulation properties. Green Materials. Always check to make sure any materials in close proximity to your reptiles are made out of non toxic materials. 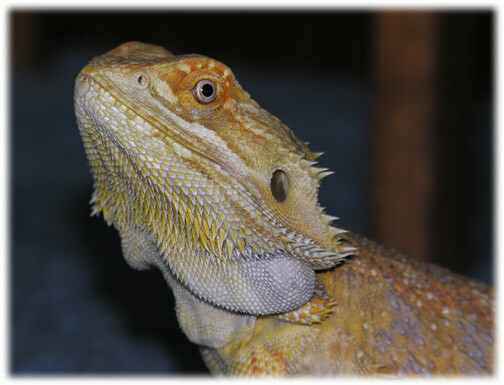 While I do not have a true "caresheet" here please click on some of the links to the left to learn more about the proper care of Bearded Dragons. Go to http://groups.yahoo.com/group/pogona and sign up. You might have to go and sign up for Yahoo Groups first though. If you have technical difficulties I can try and assist but it is pretty easy. IMPORTANT NOTE: Fireflies are lethal to Bearded Dragons. Even ONE can kill a perfectly healthy adult overnight. © 2005, www.reptilecare.com. All rights reserved.